With Host Professor Joseph Schofer of Northwestern University. Click on the link below the description to begin streaming the podcast. To subscribe to The Infrastructure Show podcasts or find in iTunes, see the clicks at the top of the page. Hurricanes and tornados can be devastating to infrastructure. The electric power grid is particularly vulnerable because it is both exposed and extensive. In 2017, Hurricanes Harvey along the Gulf Coast, Irma in Florida, and Maria in Puerto Rico demonstrated the risks of that vulnerability. 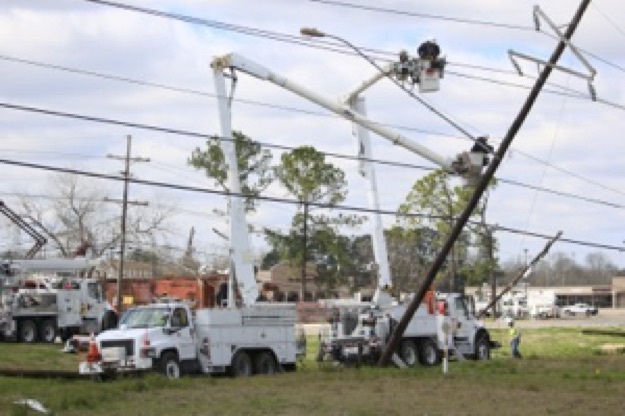 To help us understand what it takes to restore power, and in the long run, to increase the resilience of the grid, we talk with Mike Vaughn, Vice President of Assets for the Entergy Corporation, producer and distributor of electric power the Gulf region. The Infrastructure Show is sponsored by Northwestern University. Bayonne Bridge, from Bayonne, NJ to Staten Island, NY; the Tom Moreland Interchange in Atlanta, GA; Dworshak Dam, in Clearwater County, ID; a transmission substation in Orem, UT. All photos courtesy of Wikipedia.